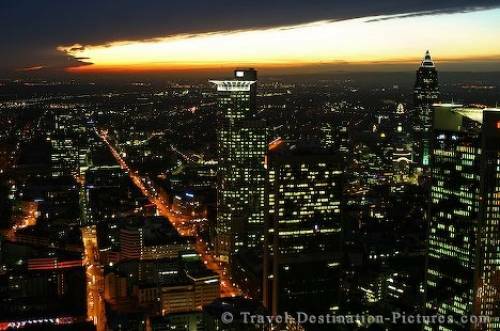 The Skyline of Frankfurt at night in Germany, Europe. The skyline of Frankfurt is the most spectacular of Germany. Headquarter of most german banks, these companys are have built their skyscrapers in a very little area. This particular view is seen when going to the top of the "Maintower" - the only skyscraper in Frankfurt, where the public is allowed to get on. Picture of an aerial view of Frankfurt at night in Germany, Europe.